Everyone knows that every Porsche is supposed to be fast. Well, by modern standards I guess a 356 or a 914 aren’t really fast at all, but just try and play along, okay? Porsche is planning on selling their all-electric Taycan later this year, and they’re planning on that car being the fastest. But not the old kind of driving-speed fastest; they want it to be the fastest-charging EV you can buy. Really, if you think about it, this is a very smart move. While the Taycan will certainly be fast in the conventional sense—it’ll do 0 to 60 mph in about three and a half seconds—being faster while charging is actually the sort of speed that owners can actually really appreciate, in a real-world way. I mean, come on, the dude’s not wrong. When it comes down to how the car will actually be used, charging time is way more important. Range is, too, and the Taycan is supposed to have a 310 mile range, which is competitive with companies like Tesla. 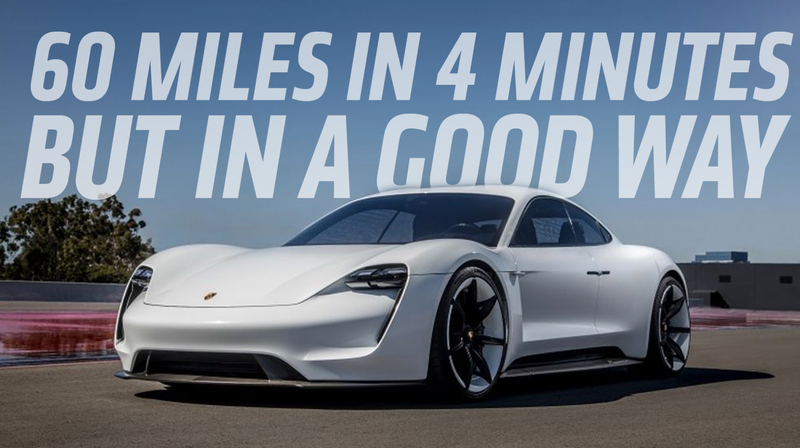 With that in mind, Porsche is designing the Taycan to have an 800V battery that can take a 350kW charge, which will allow it to get 60 miles of range in four minutes. To provide that super-lightning-punch 350kW charge, Volkswagen has a subsidiary called Electrify America that is planning to build a network of 300 highway fast-charging stations that will at least be started by July 1st, and by early 2020, 120 Porsche dealerships are supposed to offer fast charging stations as well. By comparison, Tesla’s Superchargers use 120 kW charging stations that can get a Tesla to 80 percent charge in 30 minutes, which is over 250 miles, but there’s nothing equivalent to Porsche’s 60-miles-in-four-minutes charge, and the Porsche could likely hit a similar range or higher in 30 minutes as well. When you buy your new Taycan, you’ll get free charges at any of these charging stations for three years. I mean, it’s free if you don’t figure that the cost is factored into the overall cost of the car, because of course it is. The official price of the Taycan has yet to be released. Three years of “free” charging and a super-fast and useful way to get 60 miles of charge make the Taycan a very formidable Tesla-fighter, especially when you add in the striking styling of the car and the significant clout of the Porsche brand. Tesla has managed to stay untouchable from competition like the Chevy Bolt largely because of more intangible criteria like styling and status; Porsche will be the first really well-equipped challenger that could knock Tesla from the EV Status throne.